Asylum Seekers Workshop at 1st French Convention On Welcoming Migrants, Grande-Synthe, March 1, 2018. Photo: Suzanne Lehn. Used with permission. We cannot take in more refugees. As we can see from the quotes above, it has become more commonplace for many people to talk about an immigration “crisis”; however, the reality is that immigration is nothing new in France. So we wanted to get a sense of how this very large issue is currently framed in French media. Our exploration first brought us to the term immigrant, or a person entering a country or area for a long-time stay or with the intention to settle there. We then looked at the term migrant and migration which describes the movement of individuals or groups from one place to another — something as old as humanity itself. Finally, we also looked at the words asylum seekers and refugees. As we looked deeper at this topic, we wanted to know: Can we learn more about this so-called crisis through an exploration of how the media discusses immigrants, migrants, asylum seekers and refugees? In broad terms, France became a country that welcomed immigration after the end of World War II in 1945. During the years of post-war reconstruction, France was experiencing a serious labor shortage and the government was eager to attract workers from all over the world. Before and after Algeria's independence from France, Algerian workers contributed to the growth of the French economy and were allowed to bring along their families which contributed to the growth of a thriving Muslim community. At the end of the 1970s, France also rallied to welcome over 100,000 Vietnamese boat people who had fled their country after the collapse of the US-supported South Vietnamese regime. However, in its more recent history, some feel that published immigration statistics in France are thought to lack detail and transparency. The government seems reluctant to provide developed statistics and there are continued disputes over the actual number of deportees — something the government considers to be a significant indicator of the efficiency of its immigration policies. Some of these deportees are repeatedly coming back, such as Romanians (who happen to be E.U. citizens.) However, once we take a closer look at the immigration issue in France, we can see some surprising facts — such as the fact that Albania was the first country of origin for asylum seekers in 2017. This uneasy relationship to facts has created a persistent gap between rhetoric and reality, leading to fueled suspicions, distrust, and the exploitation of xenophobic sentiments. This, unfortunately, can be seen in the language that some political figures use to discuss issues around immigration. For example, compare the shifting statements of former socialist Prime Minister Manuel Valls, now an independent MP supporting President Macron's ruling party. Manuel Valls a appelé jeudi à “éviter toute déclaration à l'emporte-pièce” sur la question des migrants, estimant que si la France doit prendre sa part dans leur accueil, elle est “loin d'être submergée”. Manuel Valls called on Thursday to “avoid piecemeal statements” on the issue of migrants, saying that while France must play its part in welcoming them, the country is “far from being overwhelmed”. Some may see the move from France being “far from overwhelmed” to “we do not need another immigration” as a testament to the change in rhetoric towards a more hardline stance on immigration from many sectors of the political sphere. Il y a, en effet, dans le monde trop de drames, de pauvreté, de famine pour que l’Europe et la France puissent accueillir tous ceux que la misère pousse vers elles. There are, in fact, too many tragedies, poverty and famine in the world for Europe and France to take in all people pushed towards them by misery. In recent years, the issue of immigration and migrants has gained more and more glaring visibility — think of Calais and its infamous “Jungle” — which has fueled the rising electoral success of right-wing populist political parties all over Europe and elsewhere. 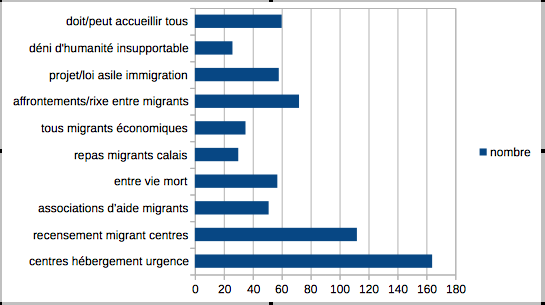 To begin our exploration, we used the Media Cloud data analysis tool (see box) to search for topics related to immigration and migration in several French media collections. 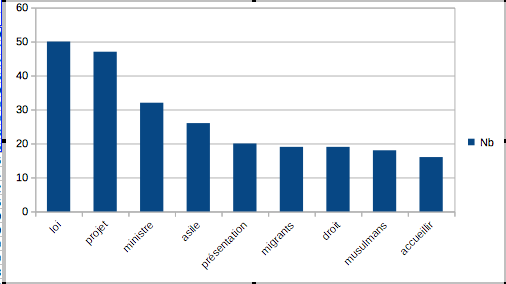 To try and look at how French media is representing the issues related to France itself, our first search looked at the use of immigration (and its associated word immigrants) as well as migration (and its associated word migrants) in sentences alongside the word “France” in the French media collections. We started with November 2017 but ended up tightening the timeframe from 2018-01-01 to 2018-03-21, which provided 146 stories related to immigration and immigrants and 707 stories related to migration and migrants. Word Cloud search results using the term “immigration” from 2018-01-01 to 2018-03-21. Translation of highlighted terms: law; bill; asylum; accepting; fact; should; asylum-immigration; smugglers; anti-immigration; Europe (and European). Terms most frequently associated with “Immigration”. Translation of words: law, bill, Minister, asylum, presentation, migrants, right (legal sense), Muslims, take in. Search results show that some key themes are related to law, asylum, migrants, and Muslims. As we delved deeper and began to analyze the articles associated with the words, one example stood out in particular: The “asylum-immigration” bill. The major provisions of the “asylum-immigration” bill, which was submitted to the Cabinet in February 2018, are intended to expand maximum detention periods and to restrict the possibilities of appeal. To “balance” this goal, the government has made provisions for an “integration” component, including some measures which might be added to the bill later on. 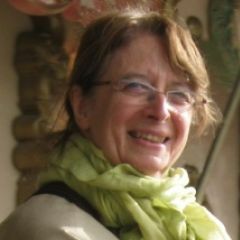 “Je crois qu'il était important d'avoir ce texte qui nous permet de mieux accueillir, de mieux intégrer […] et puis aussi d'être plus efficace, d'être plus ferme sur les reconduites”, développe l'élue. “L'objectif est de montrer que l'on a une identité en France, qui est celle du droit d'asile. On va la préserver et l'améliorer”, assure-t-elle. “I think it was important to have this bill which allows us to welcome better, to integrate better […] and then also to be more effective, to be firmer on the returns”, the M.P. explains. “The objective is to show that we have our identity in France, which is that of the right to asylum. We will preserve and improve it,” she assures. “The draft that will be presented tomorrow is a resolutely repressive bill, whose centre of gravity is leaning considerably towards a logic of control, sorting and expulsion of migrants,” deplores the head of the association. Here we are introduced to the crux of the issue — whether or not it is right to sort incoming migrants, creating distinctions between the type of migrant that will be accepted into the country. The translation of the three-word combinations from top to bottom are as follows: could/should take in refugees; all economic migrants; Muslim community Europe Combos; law-asylum-immigration Combos. These combinations help us to understand the keyword terms in context as they show the words that most often precede or follow the keyword in a sentence. 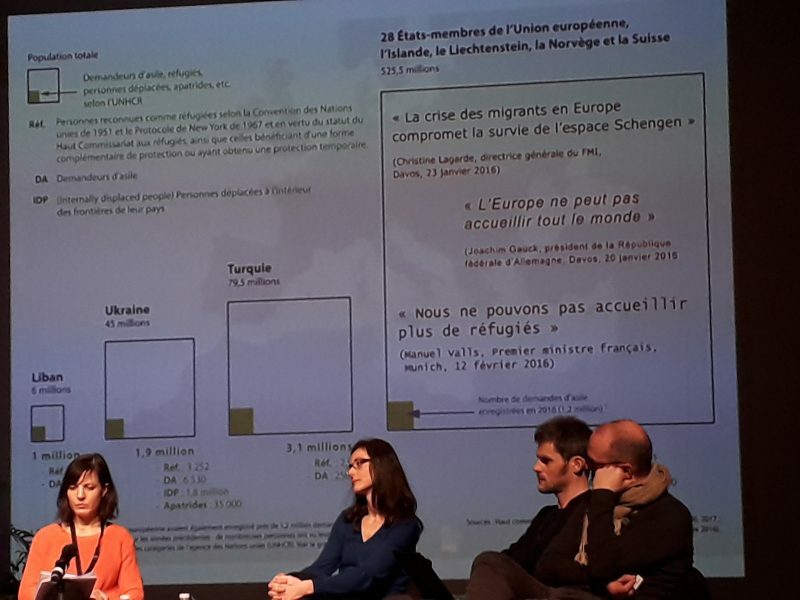 When we look at the combinations themselves, we can see interesting points of conflict: “could/should take in refugees could be interpreted as a tension point between France as a so-called humanist state and defender of human rights and its actual closed-door immigration policy; and “all economic migrants” could be seen as a tension point between ‘accepted’ refugees and all others who must be denied access. In this passage, we see Collomb making an arguing for the need to select people — separating those that are escaping wars and threats (they can prove) and those who are trying to find better jobs. So, is a person's right to freedom of movement all in the name we give them? In order to erase the rhetorical divide between “accepted” asylum seekers and “turned away” economic migrants, and generally promote a human vision of individuals with a name and a fate, a number of NGOs and human rights groups are pushing to use the word “exiles” instead of migrants. An “exile” is a person who was compelled by whatever reason (by choice or by force) to leave his/her home country and to settle in a foreign country. We added this term in our second search alongside the term “migrant” to see if the word “exile” brought out any interesting insights into the perception of migrants within the French context. Exil* pulls up keywords that appear in recent news which still primarily applies to ex-Catalan president Carles Puigdemont (203 mentions in 2 and a half months), who escaped arrest by the Spanish government and fled to Belgium; and an ex-Russian spy found allegedly poisoned in the UK (89 ‘Londres’ and 84 ‘mort’ mentions), whereas “Migrants” has 56 mentions. The word cloud Migrant* produces Calais; associations (disagreements with state policies and police violence); Macron; and many references to vocabulary related to law, and legal/bureaucratic practices instituted by the state. « Le conflit entre Afghans et Africains a toujours été sous-jacent. C'est malheureusement un schéma classique » de voir des affrontements entre eux, a commenté une source préfectorale. “The dispute between Afghans and Africans has always been underlying. It is unfortunately a classic pattern” to see confrontations between them,” commented a source from the prefecture. La rupture entre le milieu associatif et l'exécutif est consommée depuis plusieurs semaines, notamment après la décision du ministère de l'Intérieur d'autoriser des équipes à vérifier la situation légale des migrants dans les centres d'hébergement. The split between the voluntary sector and the government became effective a few weeks ago, notably after the Ministry of the Interior decided to allow [his] teams to check the legal status of migrants inside emergency accommodation centres. We see that references to Calais don't appear in our search for “exiles” which makes it seem that the media isn't framing people in Calais as exiles but rather migrants or people who are on the move. This concept of migrants or migratory people is one that often implies that action should be taken to prevent “fixation” and “appel d'air” or take-ins which supposedly attract more and more newcomers. 3-words combinations associated with “Migrants” Translation of words, top to bottom: should/could take in everyone; intolerable denial of humanity; bill/law asylum-immigration; clashes/brawl between migrants; all economic migrants; meals migrants Calais; between life death; non-profits helping migrants; census migrants shelters; emergency shelters. Briefly summarizing our search results, the most prominent words framing the issue of immigration and migrants can be characterized as generally negative — the use of terms that imply a crisis, restrictions by law, or danger for overwhelmed countries of destination as well as for the migrants themselves abound. As we look back to the global stage, there does seem to be a crisis when it comes to forced displacement and the trend is likely here to stay now that numbers of “climate refugees” are projected to grow. But is France doing enough to use the country's full welcoming potential? For some media outlets, public figures and experts, the answer to this question is “no”. In fact, some are tirelessly working to set the facts straight, to raise awareness about violations against migrant rights and to denounce state violence against vulnerable populations. Some are beginning to acknowledge that media coverage of immigration/migrants has some substantial gaps and are working to fill them. We can see this with the recent March 2018 French Convention Nationale sur l'Accueil et les Migrations, a meetup of various players in defense of migrant rights. For some, the point is this: Calling people “migrants” is a way to characterize them as people on the move which defines them as people who should keep moving, as people who don't belong in “our” territory. In this case, solutions to the situation require us to change the very terms of our reporting. As long as the word “migrants”, which is devoid of any legal significance and therefore cautioned against by the U.N. and NGOs, is used to frame the situation, robust remedies to the crisis are difficult to foresee.